Scent in the garden is like the watermark on fine piece of linen stationary: almost imperceptible. Yet the same piece of linen without the faint watermark is noticeably less impressive, blah, boring. Scent is a quality that enhances the emotional experience of the garden but is usually just below the surface of conscious observation. Take the fragrance of the earth and the bounty of scented flowers away, though, and our garden of pleasure becomes noticeably less memorable. How to get started is often the hardest part of a new gardening venture. 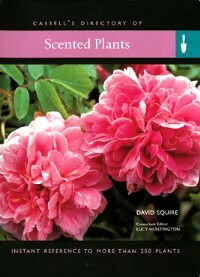 Scented Plants by David Squire is the perfect way to start planting for fragrance. Laid out in short chapters that cover many aspects of scented plants, this book provides just enough information for the beginner to truly get involved in aromatic gardening. The first chapter explains scent and the different ways plants perfume the air. It also provides suggestions for plants that will provide scent throughout the seasons as well as into the evening. The water color graphics of these seasonal gardens will spark your imagination and you will find yourself situating these layouts amongst your own landscape. The second chapter covers the mechanics of creating the scented garden. How to plant, prune and care for the garden of your fragrant dreams. There are suggestions for everything from doorways to water gardens. Need a fragrant trellis cover or windowsill box filler? How about filling that old wheelbarrow with an ocean of perfume? You can even choose plants to add to your existing gardens, whether they be cottage gardens, wild gardens or formal gardens. The last chapter is a quickie encyclopedia with full color photos and the particular growing requirements of more than 250 plants. Just one caveat. We did find one reference to use of a chemical pesticide. There are better ways to fight pests. We suggest The Organic Gardener's Handbook of Natural Insect and Disease Control. All in all this is a great book for anyone interested in putting in airs! Other books on scented plants you might like.